(1) Slowing Metabolism: Our metabolism slows down by 10% every 10 years! I always knew it slowed down, but I didn't realize it was this much. This is a huge bummer -- for someone like me that maintains my weight at about 1500 calories a day, that means I have to cut 150 calories every 10 years. The article says a way to work around this is to eat five small meals a day instead of the typical three bigger meals which give your body an excuse to store food. (2) Meat vs. Veggies vs. Grains: If you are trying to figure out how much of each of the food groups to eat (for staying healthy and maintaining your weight), the guidance is: 25% of your diet should be from animal protein in 4 ounce portions, 50% of your diet should come from fruits and veggies, and the other 25% should come from raw nuts, beans, legumes, whole grains, brown rice, quinoa, buckwheat, etc. (3) Staying Hydrated: If you don't drink enough you might start retaining water, which means more pounds on the scale. Water also helps us flush toxins out of our body which is, of course, a good thing. I know I particularly struggle with getting enough fluids at work, although I'm making a huge effort to get my eight glasses of water a day. - 12 ounces of warm water. This promotes good digestion and increases your metabolism. I haven't tried it yet, but I will this weekend after I buy some apple cider vinegar. Let me know if you try it! It sounds kind of scary to me. Interesting article! I'm not sure I could take that drink! Apple cider vinegar? YUCK! Very interesting and useful tips, thanks! The cider vinegar is supposed to be good for those who suffer from heartburn as well. I would try it ... but I'm not loving the maple syrup. Obviously, I love the taste of maple syrup, I just don't like to start the day with sugar. Still, I might give it a try. Let us know if you do. I'm curious! It is true that starting your day with water with some vinegar in it is good for you. It also cleanses the body.But you can also use lemon instead of the vinegar!The maple syrup I am guessing is for sweetness if you can;t stand the acidic flavor. good tips! the breakfast drink sounds interesting. I wonder if you could sub agave nectar or honey for the maple syrup? what do you think? apple cider vinegar/honey mixture is what my grandmom says to drink when you have a cough. I'm interested to see how you like the drink...10 % every ten years? I need anti-aging pills! I've really been trying to up my water intake lately. The heater cranking at work has been drying me out big time! Hmm, I'm not so sure about the apple cider vinegar increasing your metabolism though I have heard it used for other ailments, I'd be curious to know where they got that info. BUT I do know that another way to fight our metabolism decreasing with age is to gain lean muscle mass, so weight training is key! Is that a Nalgene? 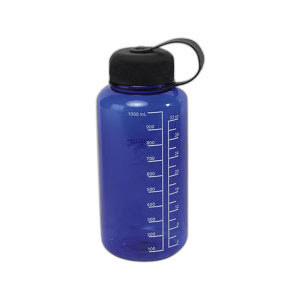 Love Nalgenes. I hope a study comes out soon that they don't actually promote cancer or whatever. I miss my Nalgene. i think that drink sounds good actually! i love maple syrup and when i was on my juice fast, i ended up drinking a lot of the master cleanse drink because it was so sweet and delicious!! Thanks for the tips. I just bought a new Sigg water bottle from REI (on sale). Need to put it to good use to keep myself hydrated. Whoa, 1500 is for maintenance? I always thought 1800-2000 calories was the recommendation for women. Just out of curiosity, what would be the target for losing weight? Hi anonymous -- it totally depends on you. Your caloric targets are based on your age, your lifestyle (like whether you sit at a desk all day like me), your height, and your current weight. You can search around on the Internet for sites that let you calculate an estimated amount of calories you burn per day naturally, and how much you'd have to reduce them to lose 1-2 pounds each week. If you can't find one let me know and I'll find one for you. Great question by the way!